If you haven't considered Volkswagen as a competitor in the SUV market, think again. The 2014 VW Tiguan is a class leader in its own right: It features one of the nicest interiors of any comparably priced SUV, room for up to five passengers, and an award-winning 2.0-liter TSI 4-cylinder turbocharged engine. After receiving some upgrades in 2013, the new 2014 Tiguan features more technology and sport utility features than ever before. You won't be hauling eight people and thousands of pounds of cargo with the Tiguan, but that's not the point. It's not a traditional SUV; it's a crossover that's perfect for the family that wants a little more pep in their vehicle. It's more than capable of holding the kids, the groceries, your pet Labrador and speeding past most other crossovers on the road. 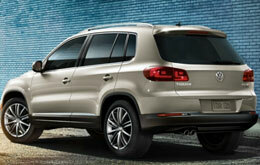 The 2014 VW Tiguan is available in Orlando in three trim levels for the new model year: S, SE, and SEL. Buyers may also choose to pick up the all-new R-Line model, which adds sporty exterior accents and a sport-tuned suspension. An automatic transmission is standard on all models save the Tiguan S. Shoppers can chose from rear-wheel or four-wheel drive. The Volkswagen Tiguan S is surprisingly well-equipped for featuring such a low MSRP. It comes standard with: keyless entry, air conditioning, 16-inch wheels, cruise control, powered windows, doors and heated side mirrors; Bluetooth, an eight-speaker AM/FM/CD stereo system and auxiliary jack, cloth seats, reclining rear seats, a tilt-and-telescoping steering wheel and more. The VW Tiguan LE adds leatherette seats, heated driver and front passenger seats, and tinted windows. VW Tiguan SE and SEL owners in Orlando will love the addition of extra technologies and amenities, like: push-button start, automatic windshield wipers, full leather seating, dual-zone climate control, exterior chrome accents, foglights, a leather-wrapped steering wheel and shifter knob, a premium touchscreen audio system, a powered driver seat and adaptive bi-xenon headlights. Optional features include a sunroof, navigation and a rearview camera. Continue reading this VW Tiguan review below for more helpful information and a comprehensive video. 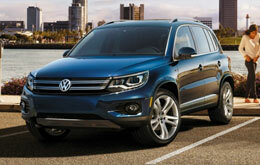 The 2014 Honda CR-V, Chevrolet Equinox and the Toyota RAV4 are no match for the 2014 Tiguan! Just compare Volkswagen's most current model to them and you'll see that it wins over the competition easily. 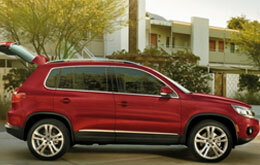 FL shoppers will appreciate the Tiguan's modern features and competitive sticker price. It's a fabulous value. Just compare its price to the vehicles in its class and you'll undoubtedly see why so many Orlando drivers love it. See our bullets for more information about what it offers! Make the most out of your next Volkswagen purchase. David Maus VW South offers reviews like the 2014 Tiguan one above, along with reviews of older models, so you can research before you buy. With the aid of some of the most knowledgeable automotive writers in the business, we've managed to get reviews written for all of our models. Once you start reading, you'll find that this article is up to the hilt with vehicle specs in a set-up that's easy to read. Use it to get the info you need to make an wise purchasing decision. Is the Tiguan not the right pick for you? Learn more about other vehicles on the lot at David Maus VW South using our reviews index page. 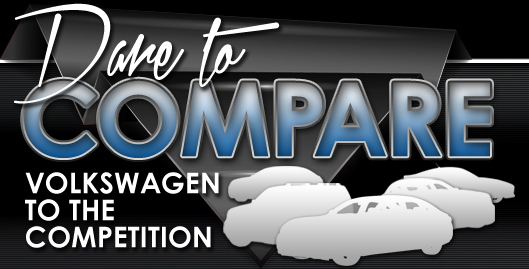 With it you can review and compare Volkswagen's entire group of vehicles.